I seek shelter + comfort. – Where Is My Teaspoon? I seek shelter + comfort. Oh the joy that is cream tea! Cream tea is a massive thing in England and is served in all tearooms across the country. 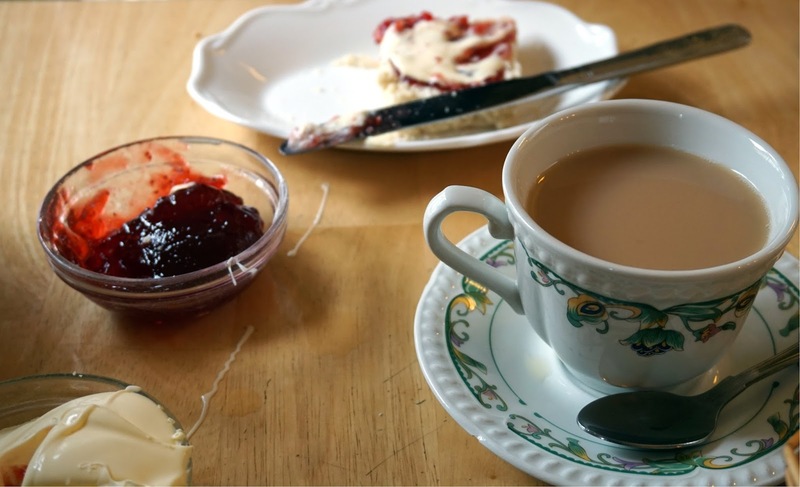 Basically, you get a pot of tea and two scones with thick, double cream and strawberry jam each for less than a fiver and it is somehow acceptable to eat it all because it is cream tea and not just a casual mug of tea and two massive scones. I shared some details earlier in the week about our recent trip to Cornwall, and mentioned all the rain we experienced while we were there. When we went on our day trip out to St Ives we sheltered from the rain in Madeleine’s Tea Room and decided to treat ourselves to Cornish Cream Tea. 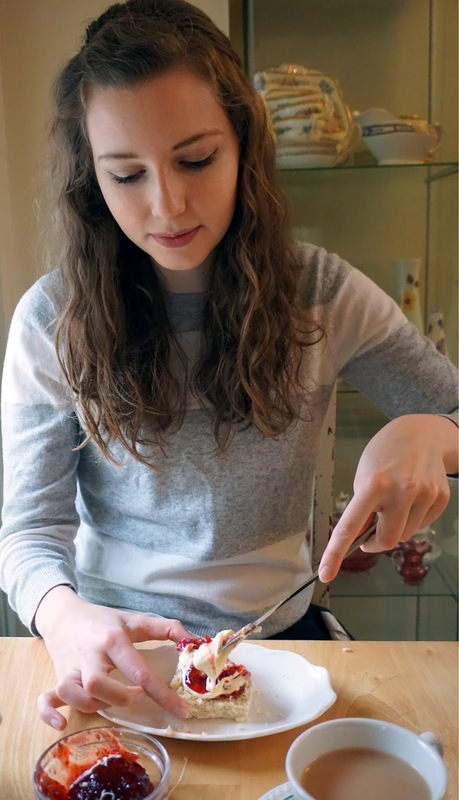 If you have been following me or my blog for a while, you’ll know I have a big thing for scones but I’m not overly sure I’m a big fan of cream tea. Don’t hate me. It just comes down to me preferring butter to cream, but while I was in Cornwall I really wanted to try a traditional Cornish Cream Tea so ate it all up anyway. 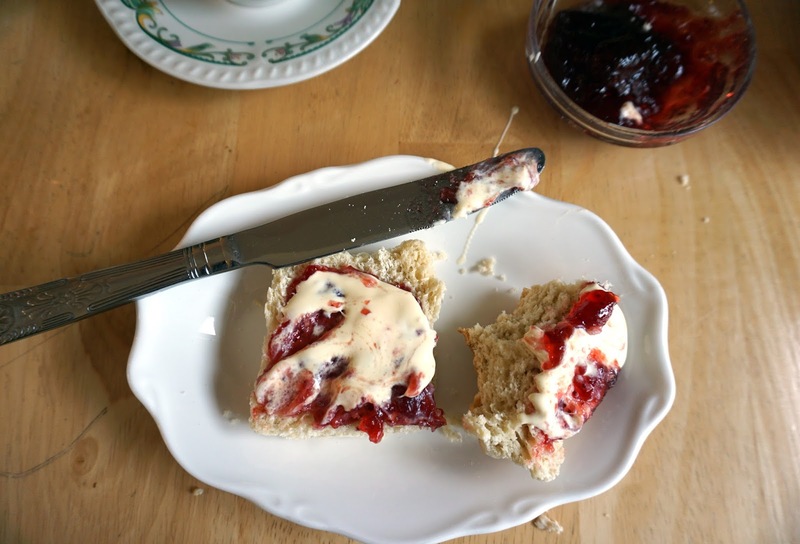 From my online research, I have learned that Cornish Cream Tea is often served as a bread roll type scone rather than an every day scone you might find in a regular coffee shop. This was certainly the case in Madeleine’s, as the scones we got were very soft. The jam seems to go on the bottom and the cream blobbed on top but I just swirled mine all in as I wasn’t sure what the difference was between cream tea in Cornwall and cream tea in Devon. Always better to be on the safe side, haha! While I’m not sure if I’m a massive fan of the cream in a Cream Tea, I am most definitely a fan of the cute plate the scones were served on and the way the table was laid. Call me old fashioned but I love a teacup and saucer! In my dream life, I always imagine someone buying me a proper Tea Set as a wedding gift. I’m not really sure if this is a fashionable wedding gift or not these days but I have always loved them and seek them out in every fancy housewares store – particularly downstairs in Arnotts. I love the idea of having my own house (though with the price of rent that may never happen) and welcoming my friends and family in to a proper dose of tea and cake at my kitchen table. Let me know if you’re the same? In future I think I’ll just stick with one big, proper scone and a tea but it really was lovely to experience the real thing when in Cornwall and was a relaxing way to spend a bank holiday Monday and escape the rain. Don’t forget to keep following me on Twitter, Facebook and Instagram to keep up with new spots and finds. Link me your blog and I’ll be sure to check it out too!